The G R Foundation (Global Knowledge Research Foundation) is a company registered under section 8 of the companies’ act 2013, India. The company is established having primary aim to promote research activities through knowledge sharing, research, innovations to promote all sectors of industries, government and academia by way of conceptualizing research activities projects and programs for the betterment of the society and create a knowledge sharing platform to promote process digitalization for assessment of students, researchers and organizations with speed, ease and uniform approach for betterment of the society. The Indian civilization is one of the oldest in the world. The country has a glorious cultural, educational, scientific and technological heritage. To fulfill the worldwide expectation that by 2022 India would have become the third most economically powerful country in the world and growing importance of research foundation, Government of India has set up National Research Foundation for promoting R & D activities all over the country. The Digital India program of Government is a great initiative to transform India into a digitally empowered society and a knowledge based economy. An ambitious plan for Broadband Highway, Universal Mobile Connectivity, E-governance is undertaken by Government. As India is marching towards the path of research and innovation, GR Foundation being a non-profit organization is striving to be the contributor in India’s Global presence. For this purpose G R Foundation is providing a platform for collaboration of world class research organization and their academia & Industry. The people and nation-centric thrust to science, technology, innovation, research and societal pursuits remains the cornerstone of GR’s mission. The efforts are meant for harmonizing the goals they can contribute in the field of education, research and manpower development. The major stakeholders who are contributing in the research programmes conceptualized by G R foundation are mainly from academia, industry and Government. All the efforts of the foundation are focused on bringing the global research community on a common platform with their Indian counter parts to achieve sustainable growth and development in various structure of Indian economy. GR Foundation plays a pivotal role in partnering and strengthening Indian industry, Academia and Government in all sectors for global research and innovation and technological support for sustainable growth and development. 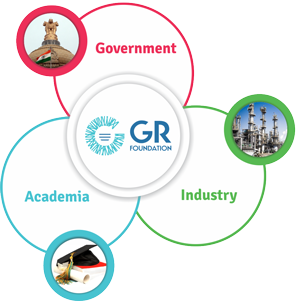 The main objective of GR foundation is to provide and create a platform for collaboration of World class Research Organisation and their academia and industry bringing together three different sectors Academia, Industry & Government for sustainable development in the field of Research. Students / Researchers / Sustainable organizations for betterment of the society. To promote Research Environment capable of sustaining all kinds of research activities needed for the generation and dissemination of newer knowledge on a long-term sustainable basis. To conceptualize events for Knowledge sharing, promote digitalization of assessment of students, researchers and organizations with speed, ease and uniform approach for the economic development of the country. To create knowledge, innovation and entrepreneurial support system through a collaborative community of national and international experts, practitioners and other partners. To help India become inventive and creative, and to become a global leader in sustainable technologies without social and economic handicaps affecting the evolution and diffusion of green grassroots innovations. Open innovation and crowd sourcing by creating and harnessing open source platform connecting students, academia, government and industries across the country nationally and internationally by way of Indian knowledge Delegation to different countries thereby providing an opportunity of networking meets. Nurturing talent in Research through its ‘Research Fund Initiative’, grooming young minds with emphasis on research based education and help private institute students/ bachelors in funding through the support of Educational Institutes (National/ International)/ Government / Industries. GR Foundation through its G –Initiative (Green Initiative) aims to preserve eco-logical services such as promoting environment awareness by way of felicitating the Industry/ Academia/ through certificates under the ‘G-initiative for planting of trees, nurturing environment and promoting awareness on the various means and methods of promoting green economy. Socio-economic transformation through Information and communication technologies for wider area for participatory enterprise development. To collaborate with and to seek co-operation from other research and educational institutions of India and abroad with a view to promoting Research activities among ‘Students, academia as well as independent researchers. Create and preserve the awareness among the Teaching Community about the “Role of Research” in the process of Knowledge – acquisition, processing, and storage of existing knowledge on one hand and on the other hand, in the process of generation and dissemination of newer knowledge driven by the acquisition of existing knowledge.